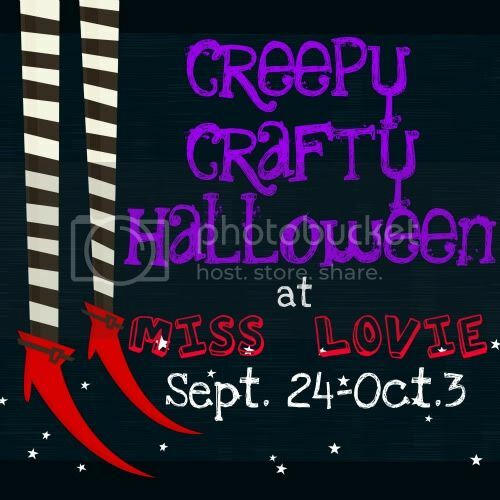 Miss Lovie: The Big Announcement: Creepy Crafty Halloween Event!!! 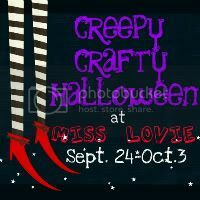 The Big Announcement: Creepy Crafty Halloween Event!!! I. Love. Halloween. I'm pretty sure it's my favorite holiday. Ok. It is. Of course I love Christmas and I might get just as excited about Christmas as I do Halloween (maybe), but Halloween is just SO fun. I love dressing up. I love seeing others dressed up. I love the time of year it is in. I love the decorations. I love making the decorations for our annual Halloween Party with friends. I love the fun foods. I love the glitter. I love turning out the lights and slowly reading scary stories to kids at school. (Shhhhh. Don't tell anyone. I'm not really supposed to do that!) I love spooky Halloween kids' crafts. And I can't get enough pumpkins. Needless to say, I just get ridiculously giddy when Halloween season rolls around. 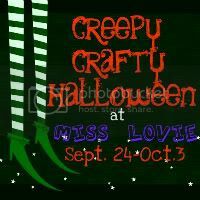 So in honor of my Halloween obsession, I will be hosting the first (hopefully) annual Creepy Crafty Halloween Event on my blog!!! It starts this Saturday and I am so excited. It's going to be a spooky, fun-filled week full of ideas for you to use at Halloween from me and the amazing ladies below! Mandi from Tidbits from the Tremaynes Alison from Oopsey DaisyAmy from Naptime CraftersKiki from Kiki CreatesDara from Teach, Craft, LoveDelia from Delia CreatesAllison from A Glimpse InsideElizabeth and Liz from Simple Simon and Co.
What a fun group, huh? !Just think: sewing projects, Halloween decor, crafts, etc! There are some really great ideas lined up and I can't wait to share them with you!! There may even be some great giveaways thrown in here and there! I hope you're as exited as I am! Wanna help spread the word?! You can grab the buttons from below or from my sidebar! I have a giveaway for you to help start things off, but it's being postponed until tomorrow!! Be sure to stop back in to check it out! !